Come Play at the Fun Palace! Interior view of the Fun Palace. 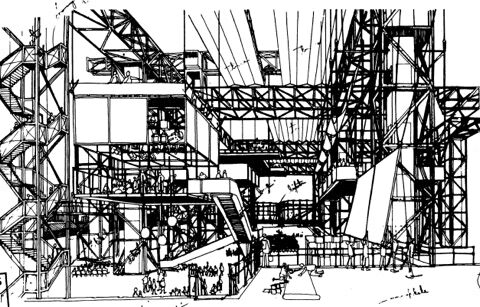 During the 1960s, theatre director Joan Littlewood, architect Cedric Price, and cybernetician Gordon Pask, along with a host of other collaborators, developed a proposal for a ‘university of the streets’. The project blurred the boundaries between education and leisure, in much the same way as the rest of Pask’s career, with the aim of creating a radically new form of education leading to social change. Both the content and the architectural structures that held it could be reconfigured, adapting to different uses while also prompting new possibilities. Despite being unrealised, the Fun Palace is regarded as a seminal architectural project and has been a major influence on architecture and architectural discourse in the decades since. While the project is less well known outside of architecture, it can also be understood within the histories of cybernetics, avant garde theatre, and radical approaches to education. Floor Plan for the Fun Palace. Do you have an inspired idea for something that is short and interactive and can repeated a number of times over a 3 hour period, please consider participating in our Evening at the Fun Palace!